The Bible is an important religious book that helps millions of people today live a decent life and be inspired to improve the quality of life. Many of the Bible’s writers edited existing, original material or wrote under the name of a familiar author. These latter-day editors/authors came from the perspective of a fear-based set of beliefs based upon purification and sacrifice. Upon reading this book, How the Bible became the Bible and Gospel of Transformation, you will understand how and why this occurred. You will also understand the original positive message of the prophets and of Jesus. Those of us who are discovering our spirituality in a Twelve- Step Program or in New Thought religion are not in a mainstream, Bible-based religion. Those of us who are mainstream churchgoers usually are not involved in a Bible-quoting, Jesus-is-my-very-best- friend denomination. However, we live in a society that appeals very heavily to Bible-based religion for all sorts of support. As an example, I would imagine in the Bible Belt it’s easier for a good, solid Southern Baptist to get elected to the local school board than it is for a member of a Unitarian congregation. Will that election affect the materials used in your schools, the priorities established within the budget, the openness of the district to hire an excellent teacher who may be Hindu or may be gay? Do those school board decisions affect your community? You bet they do! State and national politicians campaign on Bible-based moral slogans. They make promises, backing them with Biblical quotes, to gain the support of very conservative, “Bible believing” groups or coalitions sometimes referred to as the Religious Right or the Christian Coalition. Many of these promises or campaign platforms can be quite divisive and polarizing. Can this affect you? Can this sway you (either positively or negatively) for a candidate or issue? You bet it can! While the references O’Dell uses are reliable and thorough, the beauty of this book is its readability. Many exploratory books that lean heavily on academic biblical research can be so dense it takes a person wholly devoted to the subject—or making their salary from it—to decipher the author’s writing style. #1 It's time you learned the real story of the Bible for yourself. #2 Many Protestant fundamentalists and evangelicals believe the Bible was almost literally "faxed" from God, and they are not shy about saying so. 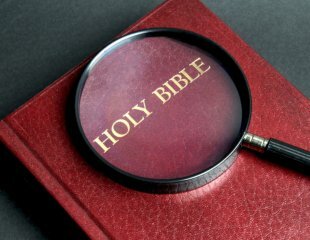 What is it you believe about the Bible? This book will help answer that question. #3 There are times when issues about gay people or Jesus or miracles or abortion comes up. You need to be able to offer yourself (and your children) a real answer - your answer. Perhaps you are one of the millions of “mainstream” churchgoing Christians who does not consider yourself a Fundamental Evangelical. You do not believe that the Bible contains the exact, almost dictated, words of God. You support a congregation with your time and money. You attend Sunday school as well as Sunday morning worship. Your children attend with you, go to some of the youth group activities, and attend a summer church camp or vacation Bible school. You understand enough to believe that the first eleven chapters of Genesis consist of local (to the Genesis writer) myths, fables, and allegories. At a party, if someone begins to extol the virtues of some political movement or condemn certain societal actions and uses quotations from Scripture to support their argument, you will generally smile, remain quiet, and be respectfully polite. After all, quoting Scripture is not your “strong suit,” and the last thing you want to do is become engaged in a religious argument. But it bothers you to listen to someone like that. Isn’t there something you can say? Or should say? Maybe you’re a Twelve-Stepper or a mainstream churchgoer, you may consider yourself a nontraditional believer. Perhaps you’ve found New Thought religion—Religious Science (Science of Mind), Unity, Christian Science, or blends of Eastern/Metaphysical thought—intellectually stimulating and spiritually comforting. These approaches simply make sense to you. Questions about God, the meaning of life, the moral foundations of good and bad personal behavior, meditation, the afterlife, and prayer are not only relevant, but the answers you are getting are actually intelligible and usable. Writings about spiritual paths, inner peace, stress reduction, creativity, addictions, health, holistic and alternative therapies seem to be right on the money for us. They all talk to us about essential spiritual things—the mind-body-spirit connection—in a language we can understand. Share Your Experience Of Reading How the Bible became the Bible and Gospel of Transformation.